Tobizu-mukade (Scolopendra subspinipes mutilans) is a centipede of glossy black body with a red head and yellow legs, is classified in the order Scolopendromorpha,the family Scolopendridae. It ranges 8 to 15 cm in length that rarely grows to 20 cm, is the largest in Japan’s native centipedes. Mukade (=百足 or 蜈蜙 or 蜈蚣 or 蝍蛆) is a Japanese term means centipede, i.e. a general term for the arthropods classified in Myriapoda, that has many legs with highly developed motility enable it to be a predator. “Tobizu” in the Japanese means red head or reddish-brown head is derived from its appearance. The English name centipede is originated in a Latin words “centi“ means hundred, and “ped” means legs. The life of centipedes is 6 to 7 years on average, is comparatively long. As they look poisonous, their claws (evolved from the front pair of limbs) are venomous, therefore bites to humans cause swelling with acute pain. The venom is similar to wasps’ that mainly consists of histamine and hemolysin protein, that breaks down red blood cells. Oiled as well as dried giant centipedes have been approved as an ointment for wounds and burns, known as a folk medicine, thereby some of them are on the market. For instance, there is a Korean food therapy which is to have a boiled chicken with dried centipedes in it’s inside; in Kanpõ (Chinese medicine) that is called Goshyõ, a remedy for liver, convulsion and detoxification. On the other hand, centipede is defied as the messenger of Bishamonten (Vaiśravaṇa, the chief of the Four Heavenly Kings, an important figure in Buddhist mythology.) For instance, there are the legend battle of the Giant Snake against Giant Centipede at Senjõgahara in Nikkõ (Japan), and legend of the warrior Fujiwara Hidesato battling the giant centipede. In addition, a Japanese idiom Mayu Tsuba, also a gesture to put saliva on one’s eyebrow, means to doubt what you are seeing or hearing, is originated to the legend of Fujiwara Hidesato mentioned above: when he defeat the giant centipede, he put saliva on his eyebrow to dispel the magic, then he became able to see the centipede clearly in the flame, finally his arrow hit the enemy. Moreover, in the warring states period of Japan (the mid 15th cent. to the beginning of the 17th cent. ), centipede was adopted for a design of armors, swords and flags, with its ferocious image and a sort of folk belief that it would never retreat. For instance, it is famous that Date Shigesane (a Samurai in that period, a cousin of Date Masamune) adopted this design on his helm. For another example, Kanahori-shu (a troop of Takeda clan) was also called Mukade-shu (Centipede troop), is from its tunneling tactics. Sõma-no-Maoi, a Japanese traditional festival originated in Sõma-Nakamura-han, is like a sports imitating warfare in the Medieval period; in the matches, the tacticians’ flags are designated to Sagari-Mukade (with a picture of centipede moving downwards). 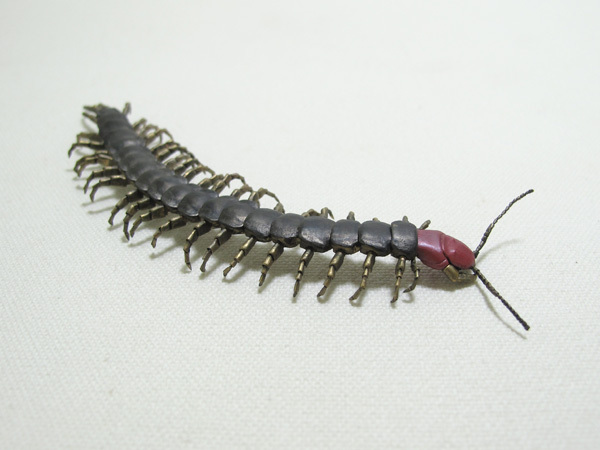 Because centipede has many legs and joints, it is likened to sending a message (through many people or things). A common belief that “centipedes usually move in pairs, so if you kill one, another one must appear then.” is wrong, merely a superstition. They do not have such a habit. You find one means, you are just in the place where many live. Since many years ago, this has been a fascinating motif, yet conversely I have taken a distance from such an unpleasant animal. By the way, finally completed! The head part was made of Hidõ (a sort of copper) to depict the original color; the legs, tentacles and mandible (jaw) are all movable. Thus, totally consists of 325 parts, is one of the largest amount in my works.